Being able to confidently manage and adjust your own insulin doses is a key part of managing type 1 diabetes, and may be required for other diabetes types as well. Self-adjustment involves estimating the appropriate amount of insulin to inject through each day to strike a balance between high and low blood sugar levels. Regular blood glucose testing and recording the results will help you to see how your blood sugar numbers change and allow you to improve your overall diabetes management. If you are not altogether confident with adjusting your own insulin doses, speak to your healthcare team. They will be able to advise you about your current dosage requirements and may book you onto a carbohydrate counting and insulin dose adjustment course, such as a DAFNE course. 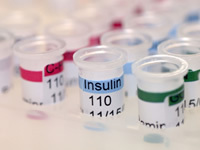 A comprehensive set of records and notes gives you the chance to spot trends in your numbers and see where adjustments may need to be made to your insulin dosing requirements. The more detailed your records are, the better your dosage estimates are likely to be. More information on good practice for recording blood glucose results and downloadable diary sheets can be found on the blood glucose diary page. Knowing what’s in the food you eat is half the battle of diabetes control. Carbohydrates tend to be the largest factor accounting for changes in blood sugar. It’s worth noting that proteins can also affect sugar levels as well. Read more on how to count carbs. When you’ve spotted a need to adjust your insulin you’ll then need to decide how to change your insulin doses. If you take both short term and long term insulin you need to factor in the fact that short and long term act in conjunction with each other and work out whether it is the long or short term insulin that needs to change. Unless you are confident with self-adjusting insulin, it’s recommended to factor in dosage changes gradually as making larger adjustments could lead to an increased chance of dosing error. Read more on adjusting your basal and bolus insulin doses. If you feel you can’t get anything right, don’t give up; instead look to build up an understanding. This can take a long time, so don’t be disappointed if you don’t see instant results, just keep working at building your knowledge. If you need advice from others who’ve lived and dealt with adjusting insulin for years, ask the Diabetes Forum. A lot of people report to find carbohydrate counting and dose adjustment diabetes courses, such as DAFNE, to be very helpful for blood sugar management. In most cases, your healthcare team will be happy to book you onto one.